The Funeral Service for Draginja (Dragica) Gorevska of Ballajura will be held in the Macedonian Church St Nikola, 69 Angove St, North Perth at 09.45am THURSDAY (18.04.2019). Following the Service the Cortege will depart for the Main Entrance of GUILDFORD Cemetery and gather for a Burial at 11.30am. 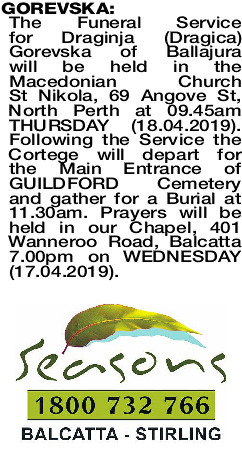 Prayers will be held in our Chapel, 401 Wanneroo Road, Balcatta 7.00pm on WEDNESDAY (17.04.2019). GOREVSKA DRAGICA You made us laugh you made us cry until the day you said goodbye. No more pain for you to bear but a heavy heart for us to wear. Now in God's hands we leave your care knowing when we need your guidance you'll be there. We all love you and miss you so much with the understanding that life is such. When the time comes we will meet again and we'll see you then.